Langtons Gardens in Hornchurch, Greater London, is 4.6 hectares of former pleasure ground to Langtons House. The Gardens are designated as a Grade 1 Historic Park and Garden of local interest and the 18th Century House, Bath House and Orangery are Grade II listed. The Gardens also lie entirely within the Langtons Conservation Area. The present Gardens date back to late 18th century and it believed they were remodeled by Humphry Repton, the great British Landscape Gardener in the early part of the 19th Century. The House and Gardens became public authority property in 1929, and the House overlooking the landscaped Gardens and lake is now the town’s registry office. The gardens are an important backdrop for weddings, events and informal recreation. Chris Blandford Associates were appointed as Landscape Architects and Lead Consultants based on their extensive experience in conservation and heritage management. They worked closely with the Conservation Architects, Heritage Officers and Historians to enhance and restore the Gardens, features and various spaces. One of these was the Stable Yard, an enclosed space that sits between the House and Stable Block. The Stable Yard had lost its identity and was used inappropriately as a car park; visually and physically disconnected from the remainder of the site. Through careful planning and design, the space was restored using appropriate materials and providing new facilities including a Café and toilet block. It was vital to preserve the historic context and work sensitively around the listed buildings. After extensive research, a decision was made to use Ketley’s authentic patterned clay pavers to restore a more traditional aesthetic. The design restoration saw the removal of old inappropriate lean - to structures, removal of insensitive features and signage, removal of overgrown trees and shrubs, addition of a new bin store and toilet block built with reclaimed bricks, the conversion of a garage to a Café, new heritage lighting, a new car park to eliminate cars from the space and the rationalizing of the central green space and drainage system. “It was only when we began to break through the existing tarmac that we surprisingly uncovered some original Victorian patterned pavers similar to those that we were reinstating. This was an exciting moment and a realization that the research and product selection had paid off” explained Phil Porter, Senior Landscape Architect at Chris Blandford Associates. The pavers that were uncovered were retained and reinstalled as a sample panel next to the front door to the Stable Block as a reminder of times gone and to complement and underpin the use of the new materials used. 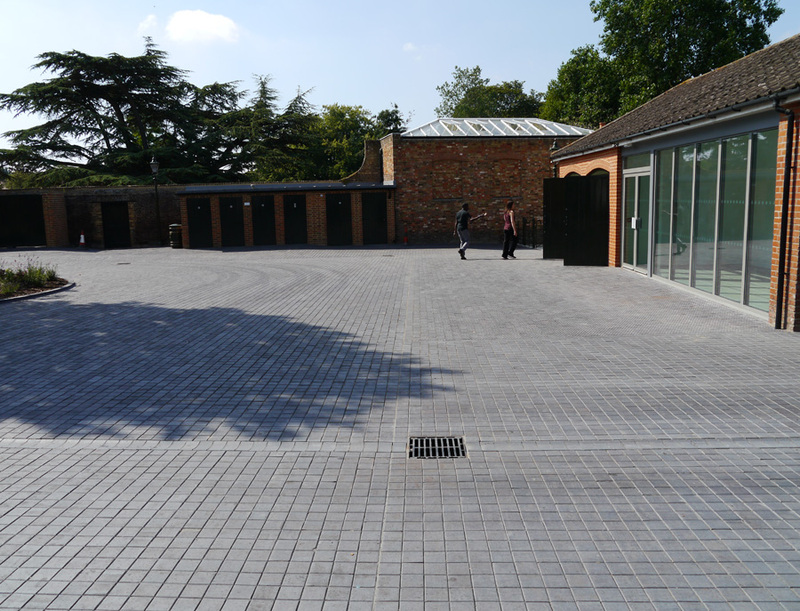 The Ketley Staffordshire Blue pavers were used in a particular way to help define spaces and break up what is essentially a large space. Different brick styles, sizes and bonds were used to aid this approach. 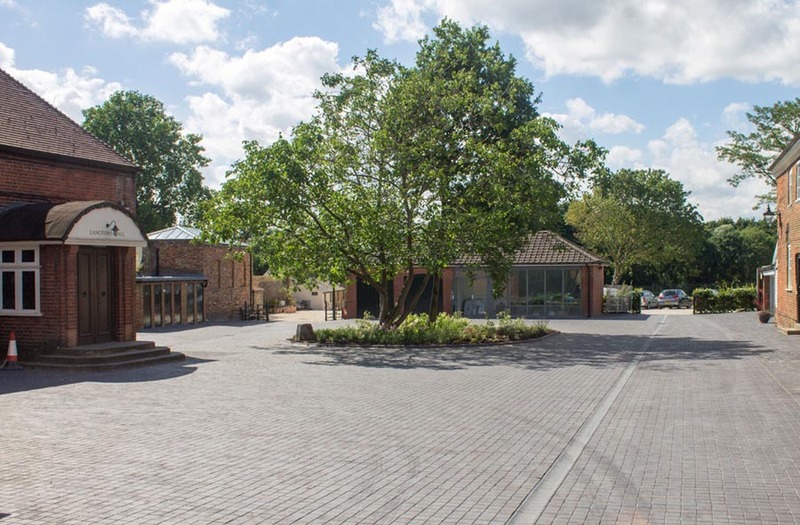 The diamond chequered pavers were used in areas close to the buildings to define pedestrian priority spaces, the 2 panel pavers were used in the central area which is used for vehicular access and these were separated with the use of a plain paver band. Drainage channels used the Ketley drainage unit specials and the Ketley boot kerb was used to emphasize the central planted space. The Ketley patterned clay pavers not only shed water rapidly and provide enhanced traction, but their traditional designs also give this outdoor space a long established look and a strong aesthetic appeal. The use of contrasting patterns demarcates different uses within the area and also adds visual interest and texture. The Stable Yard is now used as a drop off area for wedding guests arriving by vintage cars, limousines and horse and carriage. 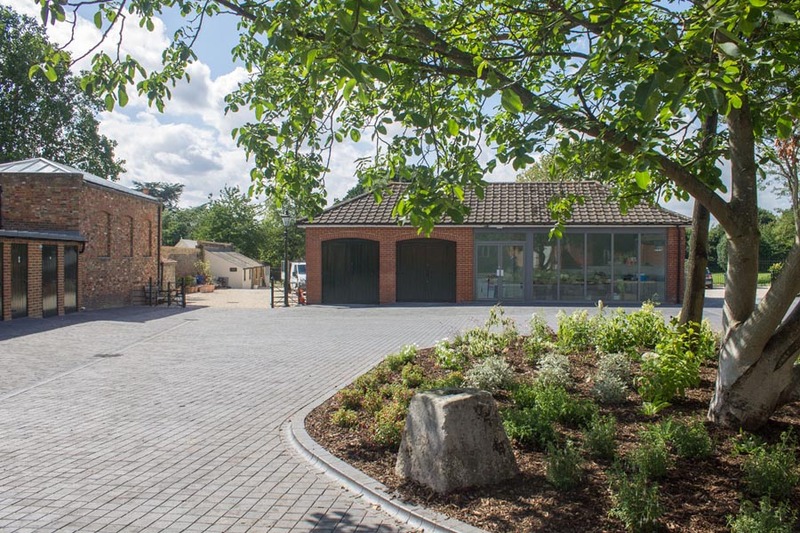 The café and toilet facilities bring the public into a space that was formally closed off and the cafe has a spill out space which overlooks the Stable Yard.